We rarely come across deficiency of niacin in the current clinical practice. Deficiency of niacin (Vitamin B3) leads to pellagra with constellation of symptoms affecting gut, skin, and nervous system. We present a case of nutritional deficiency of niacin presenting as pellagra in a 45-year-old female. The patient was treated successfully with Vitamin B3 supplementation. Pellagra shall be considered in differential diagnosis of chronic diarrhea when associated with skin lesions affecting sun-exposed areas. Pellagra is a chronic disease affecting the skin, nervous system, and gastrointestinal tract usually due to a deficiency of niacin (Vitamin B3) or its precursor tryptophan. Pellagra mostly found in parts of India, China, and Africa where corn or maize as a staple food. 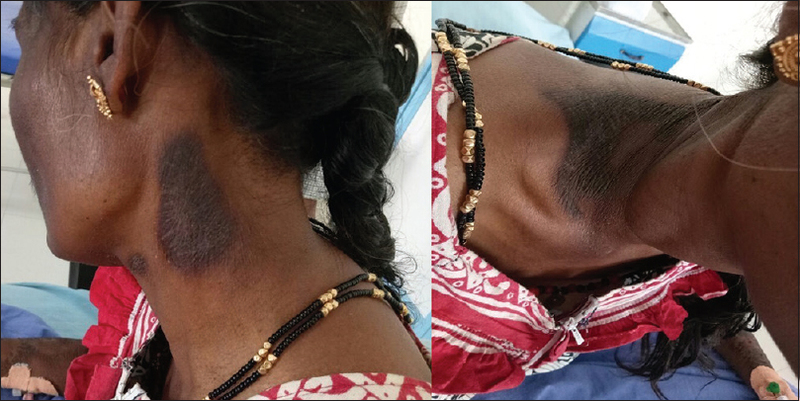 We present a case of a middle-aged female clinically diagnosed to have pellagra and successfully treated with Vitamin B3 supplementation. 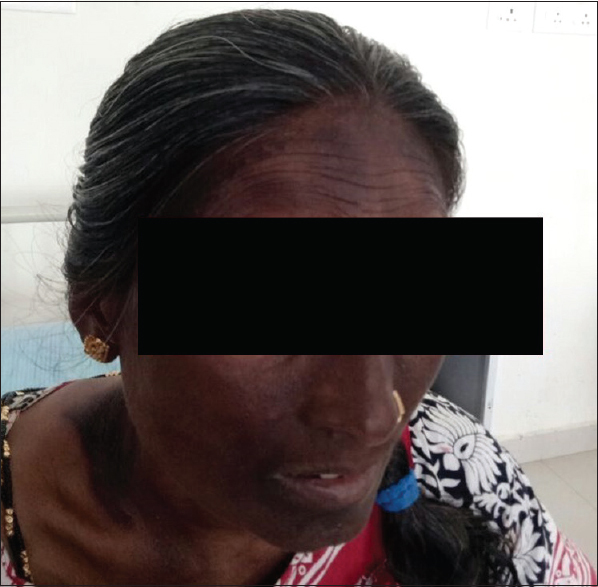 A 45-year-old female, agriculture laborer, presented with irritability and generalized weakness, loss of appetite for 14 months; dark-pigmented skin lesions over the face, neck, forearms, lower part of arms, and feet for 10 months, and loose stools (6–8/day, watery in consistency with no mucus or blood), burning sensation in the mouth for 8 months, and disorientation and decreased memory for 2 weeks. There was no history of seizures. There was history of neither flushing nor skin rash. No history suggestive of pulmonary tuberculosis was noted. There was also no history of drugs (antituberculosis therapy and phenobarbital). The patient has no habit of alcohol consumption. She was a pure vegetarian (no egg) with staple diet being jonna rottelu (Telugu) (Jonna-sorghum) and rice. She used to take less green leafy vegetables (two to three times per week) with less dairy products (<100 ml of milk/day) in her daily menu. On examination, the patient was moderately built and poorly nourished. Body mass index was 17.6 kg/m2. Vitals were stable. Dehydration and pallor were observed. Commissural cheilitis and glossitis were also seen. Hyperpigmented skin lesions including macules and plaques with scales were noted over face, neck, forearms, and dorsum of feet in symmetrical fashion corresponding to sun-exposed areas [Figure 1], [Figure 2], [Figure 3]. Neurological examination revealed disorientation and dementia. There was no focal neurological deficient. Other systems were normal. Laboratory investigations showed microcytic hypochromic anemia, and urine and stool examination were normal. Serum electrolytes and sugars were normal. Serum alkaline phosphatase levels were normal. Liver function tests were normal. Urinary 5-hydroxyindoleacetic acid (5-HIAA) and serotonin were negative. Levels of serum pyridoxine (Vitamin B6), cyanocobalamin (Vitamin B12), and riboflavin (Vitamin B1) were normal. Plasma zinc levels and serum alkaline phosphate levels were normal. Chest X-ray, ultrasound abdomen, and computed tomography brain were normal. Upper gastrointestinal endoscopy was normal. The patient was diagnosed clinically as having pellagra and treatment started with nicotinic acid 375 mg two times a day and along with supportive treatment with intravenous fluids. The patient responded to the treatment and was subsequently discharged. Pellagra (pelle agra = rough skin) is caused by deficiency of niacin. In the western world, it is almost eradicated due to fortification of flour with niacin. It still exists in places where corn/maize is a staple diet. Niacin (Vitamin B3) refers to nicotinic acid and nicotinamide which serve as precursors of two coenzymes, nicotinamide adenine dinucleotide (NAD) and NAD phosphate (NADP), which are cofactors in catabolic and anabolic redox reactions, respectively. Tryptophan is converted to niacin by pyridoxal phosphate, and this step requires Vitamin B6 (pyridoxine). Causes of pellagra can be divided into primary and secondary. Primary pellagra is due to dietary deficiency. High leucine content in corn/maize prevents conversion of tryptophan to niacin, leading to deficiency of niacin. Secondary pellagra is due to defective absorption or metabolism of niacin/tryptophan. Causes include chronic alcoholism (alcohol inhibits pyridoxal phosphate, which converts tryptophan to niacin); Hartnup disease (defective intestinal and renal absorption of tryptophan); drugs such as antituberculosis drug isoniazid, which is a structural analog of niacin, 6-mercaptopurine, and pyrazinamide, and phenobarbital (prevents conversion of tryptophan to niacin); carcinoid syndrome (tryptophan is converted to serotonin instead of niacin); and anorexia nervosa or Crohn's disease. Vitamin B6 deficiency also potentiates niacin deficiency. Organs such as brain are particularly vulnerable to deficiency of niacin, which have high energy requirements requiring NAD or NADP leading to dementia. In addition, tissues having high cellular turnover such as gastrointestinal tract and skin affected by niacin deficiency, resulting in diarrhea and dermatitis. These primary manifestations classically referred to as “the four D's:” Dermatitis, Diarrhea, and Dementia leading to Death. Pellagra may initially present with loss of appetite, fatigue, irritability, vomiting, pain abdomen, and glossitis. Photosensitive-pigmented dermatitis soon follows. Dermatitis presents with lesions affecting sun-exposed areas such as face, around the neck (called Casal necklace/Casal collar), dorsa of hands, and extensor surface of forearms., These lesions are symmetrically disturbed. Niacin deficiency leading to kynurenic acids in cells of skin is a possible explanation for skin manifestations. Gastrointestinal involvement may lead to intractable diarrhea which is 50% of patients. Neurological symptoms include dementia or encephalopathy termed pellagrous encephalopathy, presenting with apathy, loss of memory, disorientation, depression or altered consciousness, and death if left untreated. Classical manifestations will be not be seen in all patients. Diagnosis is based mainly on clinical symptoms and a history giving clues to nutritional deficiency or chronic alcoholism. Measurement of ratio of N-methyl pyridone and N-methyl niacinamide (urinary metabolites niacin) should be <2 for the diagnosis of niacin deficiency. Differential diagnosis includes severe zinc deficiency (which presents with severely depressed immune function, frequent infections, bullous pustular dermatitis, diarrhea, and alopecia) and kava dermopathy (pellagra-like dermatosis seen in Pacific Islanders). Consumption of kava from dried roots of Piper methysticum is responsible. Kava is used as a relaxing drink. Other conditions mimicking clinical picture of pellagra include carcinoid syndrome (flushing of skin, diarrhea, asthma, wheeze, and 5-HIAA in urine), Hartnup disease (childhood onset, neutral amino acids in urine), other vitamin deficiencies such as pyridoxine deficiency (low levels of serum pyridoxine levels and low urine 4-pyridoxic acid), riboflavin (low levels in blood and high red blood cell glutathione reductase activity), and dermatological conditions such as photodermatitis and actinic dermatitis (eczema, photosensitive eruptions). Treatment includes alleviation of any predisposing factors such as alcohol or drugs and avoidance of diet such as corn or maize. Treatment with 100–200 mg of oral nicotinamide or nicotinic acid thrice daily for 5 days will correct the symptoms. Pellagra though becomes a rarity of current clinical practice, shall be considered in differential diagnosis of diarrhea associated with skin lesions, particularly in photosensitive areas. Wan P, Moat S, Anstey A. Pellagra: A review with emphasis on photosensitivity. Br J Dermatol 2011;164:1188-200. Russel RM. Vitamin and trace mineral deficiency and excess. In: Kasper D, Fauci A, Hauser S, Longo D, Jameson J, Loscalzo J, editors. Harrison's Principles of Internal Medicine. 19th ed. New York: McGraw-Hill; 2015. p. 96e-4. Nadkar MY. Water soluble vitamins. In: Yash PM, editor. API Textbook of Medicine. 10th ed. Mumbai: Jaypee; 2015. p. 2598-602. Johnston M, Fatemi A, Adams H. Neurobiology of Disease. 2nd ed. New York: Oxford University Press; 2016. MacDonald A, Forsyth A. Nutritional deficiencies and the skin. Clin Exp Dermatol 2005;30:388-90. Oldham MA, Ivkovic A. Pellagrous encephalopathy presenting as alcohol withdrawal delirium: A case series and literature review. Addict Sci Clin Pract 2012;7:12. Norton SA, Ruze P. Kava dermopathy. J Am Acad Dermatol 1994;31:89-97.